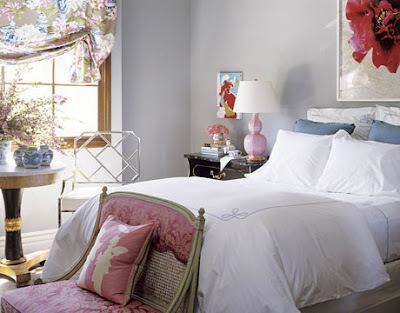 Decorator Joe Nye sums up this feminine bedroom as "Christian Dior in Palm Beach." Walls are painted Benjamin Moore's November Skies. The bed is from West Elm and the bed linens are from Williams-Sonoma Home. Double-gourd pink bedside lamp by Christopher Spitzmiller, through Hollyhock. The lavishly patterned window shade fabric is Manuel Canovas's Bragance in taupe. Photo by John Coolidge, House Beautiful.